A few clouds early, otherwise mostly sunny. High around 80F. Winds S at 10 to 20 mph.. Partly cloudy skies early will become overcast later during the night. A stray shower or thunderstorm is possible. Low near 60F. Winds SSW at 5 to 10 mph. John Raymond Kelley, 94, shares his stories from World War II. He was drafted when he was 17 and lost many friends overseas. John Kelley is pictured in his military uniform in the 1940s. Pictured is John Kelley's military uniform from World War II. John Raymond Kelley, 94, remembers his time in World War II, all of the close calls he had, and a mission to take down Adolf Hitler. "I was only 17 when they drafted me," Kelley said. "There were 44 of us that went in from here, and I've only seen one that was with me, and he is in the cemetery now." Kelley said he does not know where any of his fellow natives ended up or even if they had survived, because once they were drafted they were all split up. "I did chose to be a jumper," Kelley said "It sounded like fun, and it was. It was fun. I made 10 jumps all together. The last one I did was in Berlin before we left. We had one freedom flight and made it one time more. We came out of the jump and got on the trucks and they took us back to England." Kelley said it took a lot of training before being sent to Germany, and he had his in North Carolina. This was where Kelley had his first close call. "We had to climb like a telephone pole," Kelley said. "They had ladders up them and they had a harness on us and we went down a cable to learn how to land to be a paratrooper." Kelley said jumpers had to practice this five times and on his fifth jump the boy in front of him decided he did not want to jump anymore. "He went back down the ladder," Kelley said. "When I jumped, there's a bolt on that pole that held that cable and it went down. The boy quit ahead of me and the boy behind me, that bolt killed him. That could have been me." That experience was not Kelley's only story about his time learning to jump for planes. "The first jump I made I landed on top of another parachute," Kelly said. "I was on that parachute coming in, and they were all yelling at me 'get off, get off' and I was trying to get off. Finally I made it before both chutes landed." Kelley said as far as he knows he was the only one who landed on top of another, but that the sky was full of paratroopers. On Christmas Eve of 1944 Kelley jumped into Brussels, Belgium with the rest of the 17th Airborne into snow up to his knees. He said he had never been so cold in his life, and that he still has trouble with his feet. "When we started to go from England I was supposed to be in the third plane, there were nine plane loads of us, and my plane had a flat tire," Kelley said. "So they pulled it over and when they got that fixed, we were the last one out." At that point Kelley did not realize how lucky he was to have that flat tire. "The next morning after we got there and after we jumped in, the boys that went in ahead of us got killed on the way down," Kelley said. "If it hadn't have been for that flat tire, I would have been there." Kelley said they spent about a month there in the snow and he does not think his feet ever thawed out. "We slept in the snow," Kelley said. "We had sleeping bags and we just raked out the snow and made us a place to sleep because that was all we could do." Kelley said they carried dry food in their backpacks, but some days there would be a truck that would give them hot food. "We stopped one night at a camp the Germans had moved out of," Kelley said. "They had dug holes in the ground, they had been there a long time and they had straw in the areas where they slept." Kelley said at this camp one of the lieutenants from Arkansas who was trained to disarm bombs offered to teach some of the soldiers how to disarm a bomb that was left at the site. "That morning the breakfast trucks had come and brought us breakfast," Kelley said. "I was with one of the kids I bummed with most of the time, Val Hill was his name from Gideon, Missouri. He always like to get in on everything so I said 'give me your cup, I'll get us a cup of coffee.' By the time I got back to where the truck was, the bomb went off and it killed 12 of them right there." Kelley said his friend Hill was one of the 12. "Him and I had made an agreement that whoever got killed we would go to their folks, if we made it, and tell them about it," Kelley said. "I couldn't go tell his mom. I never did find out where Gideon was. I just couldn't do that." Another incident with a bomb also took out some of Kelley's fellow soldiers as they marched through Bastogne, Belgium. "We stopped and there was a Russian boy laying out there and there was a German Luger laying not far from his hand," Kelley said. "The kid behind me tapped me on my shoulder and said 'I'd like to have that Luger. Would you go get it for me?' I said 'no, if you want it, go get it yourself.' He just touched it and it blew him up. That taught the rest of them not to pick up nothing." 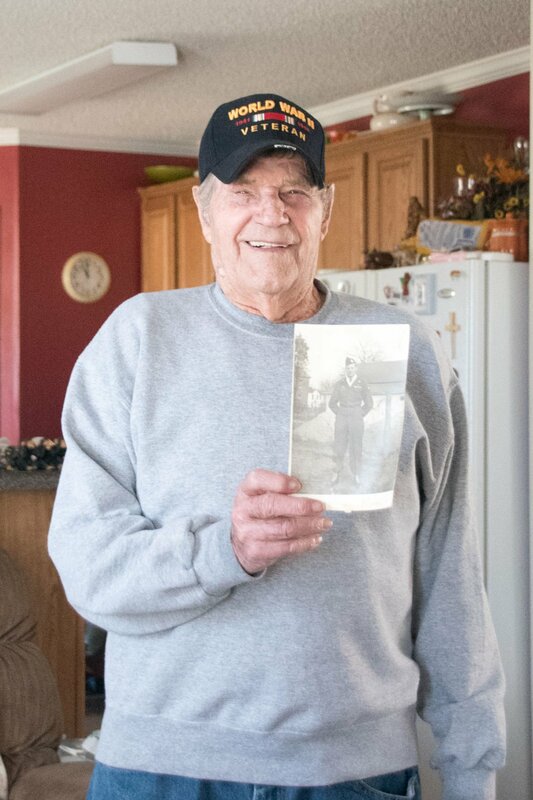 Kelley said he saw a lot of death during his two years in the war, with most of that being during the Battle of the Bulge. "We lost 19,000 in the Battle of the Bulge in my unit alone," Kelley said. "I was in the battle from the start to the finish, and it's always scary wondering if you were next. We lost a lot of boys. I was one of the lucky ones." Kelley said of course, he never got hit but he saw many shot down right beside him. "When I came back, they put us in gliders, and I got a new gun because our first gun was torn up by screaming mimis (German WWII rocket artillery)," Kelley said. "I was to shoot the tracks on the tank so they couldn't move. When we crossed the Rhine River they had hedge rows instead of a fence, it was like trees and our glider hit that." Kelley said the accident was due to bad weather with really high winds. "When we hit that, it killed both pilots," Kelley said. "Our Jeep driver came and pulled us out, but he had to knock out the back windows because it was so tangled in the trees." Kelley said the 513th Parachute Infantry jumped across the Rhine River ahead of them, and when he arrived many were still hanging in trees. "We were glad to be on the ground," Kelley said. "It was a terrible life. I will tell you that. I am surprised I lived this long through it. I think about it all the time." Kelley said they went ahead and joined the infantry walking all the way to Berlin on a mission to get Adolf Hitler. "I never saw a German tank," Kelley said. "We had them on the run. I didn't see another German soldier until they arrived in Berlin." Kelley said it was a long walk from the Rhine River to Berlin, but when they arrived, about a block or so from where Hitler was hiding out, they stopped. "I was one of the three boys from my troop that went in from there to get Hitler," Kelley said. "There were three Russian boys that came in and met us out there about a block from where he was. We could see where the place was. We had a field radio and when we got so far they told us to stop." Kelley said all of them stopped, and after five minutes or so, a voice on the radio said, "Come back to the unit. The war is over." "That was how fast it ended," Kelley said. "We saw them taking him (Hitler) out with a sheet over him to the ambulance that took him away. That's how it ended. The war was over." Kelley said it was a good feeling to be able to walk back to the unit and know it was all over. "It was enough for me," Kelley said. "1943 I went in and came out in 1945." Kelley said he took the Queen Mary three months later from England to New York where the soldiers marched in a 26-mile parade down 5th Avenue in full gear with their packs in the winter cold. "Just like we went in, we came back that way," Kelley said. After the parade, Kelley was taken to the train station where he rode back to St. Louis to be discharged on Jan. 18, 1946. Just six short months after his return, Kelley married his wife Alamae and the couple had 64 wonderful years together. As Kelley approaches his 95th birthday in May, he says he is planning to live to 100, but that he may make a different decision once he reaches that milestone.